Why? : My brothers and I were members of the short-lived Pro Set "Rink Rat" fan club in the early '90s. 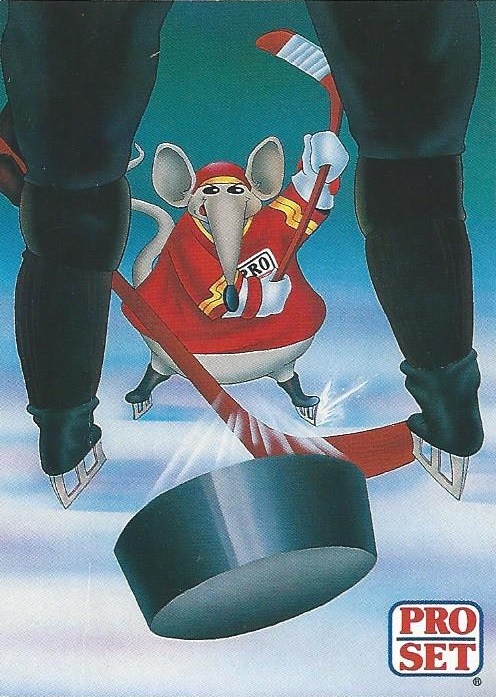 For the 1991-92 season, Pro Set produced a couple of hockey cards for the club's members featuring its namesake rodent mascot. I'm not quite sure what happened to my childhood copies, maybe I'll come across them someday. I have no idea how many of these were printed, and how many of those printed were lost to time and/or careless children, but I do know that these are relatively rare nowadays. I feel very fortunate to have secured this one for just a few bucks. By comparison, there's just a single one of these available on COMC at the time of this post, and the asking price is an astounding $45.25. eBay? Just the same card from COMC, but marked up to $56 and change. Yikes! To me though, this is one of those cards where the pure nostalgia overrides any monetary value one could assign to the card itself. 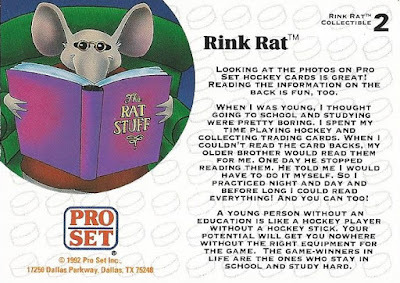 Takes me right back to a simple time in life, collecting cards as a kid. You can't put a price on that. 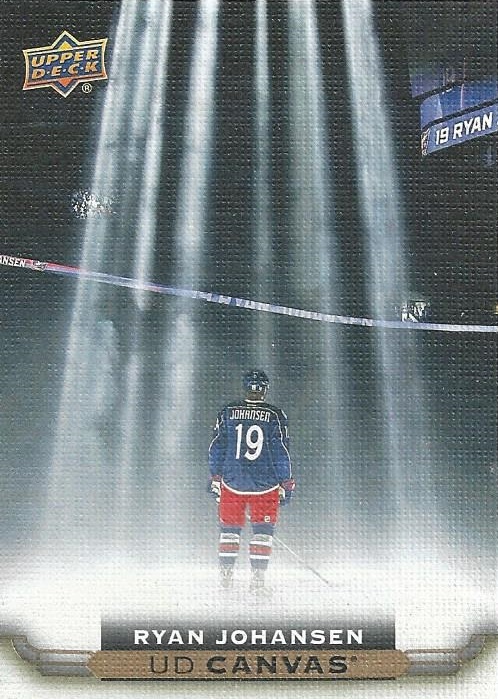 This Canvas parallel of Ryan Johansen was one of my favorite hockey cards of the 2015-16 collecting season. A stellar photo, and stellar cropping (notice Ryan's name and number on the scoreboard at upper right). I paid 32 cents for this card, and thanks to Upper Deck's e-Pack promotion you can grab a copy for even less than that today if you'd like. Every so often I look for cheap Liverpool cards on COMC, as they've been my favorite club since I started following English Premier League back in 2011 or so. 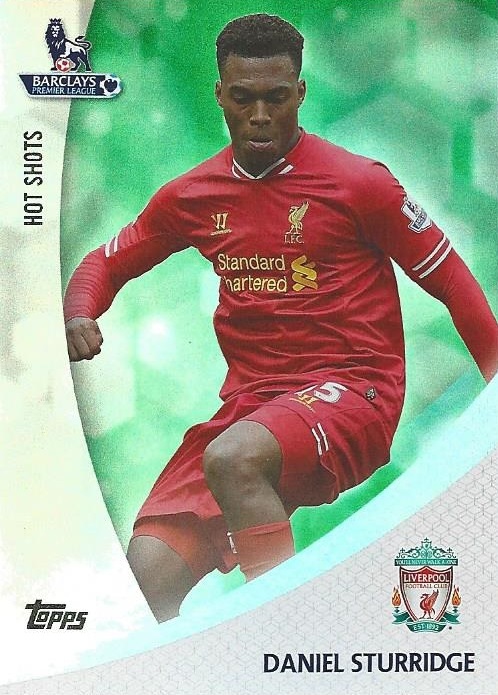 For the same price as the T-Rex above, this green parallel of Daniel Sturridge's Hot Shots insert from the 2013 Topps Premier set seemed like a good deal. 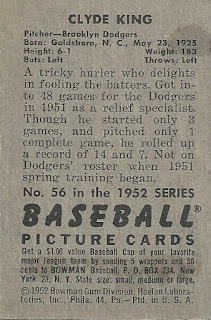 It's serial-numbered to /99 on the reverse. 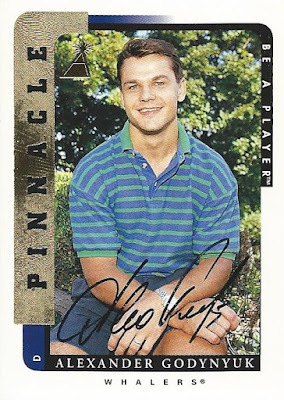 There aren't anywhere near the volume of soccer cards as there are for sports like baseball or football, so this is actually one of the more unique pieces in my very small Liverpool collection to date. Here's one for my 1959 Topps set! 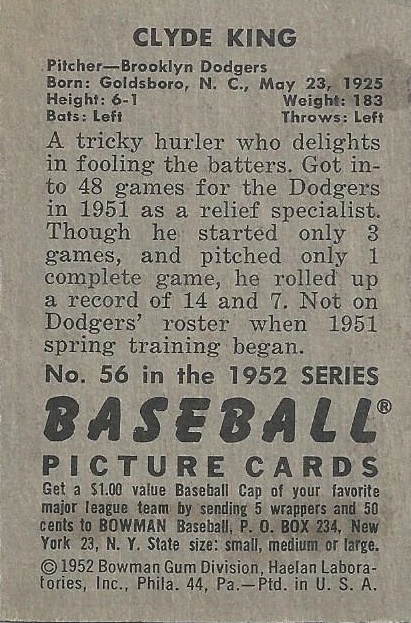 A nice high number at that (card #534), and in damn fine shape. The only issue I see is that oddness on the lower right corner, which is strange. For $2.05 I could not click purchase fast enough. I'm now sitting at 299 cards in my slow-burn '59 set build. 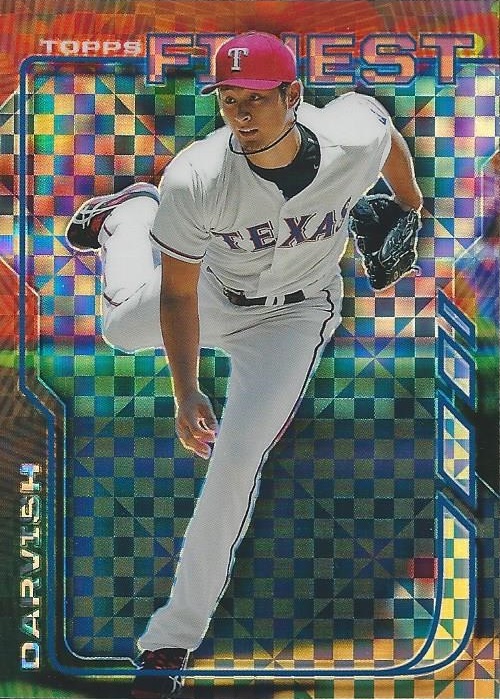 ...and Yu Darvish I spent 63 cents on. If I can keep scoring these at two-for-a-buck prices maybe I will finish this off someday after all. 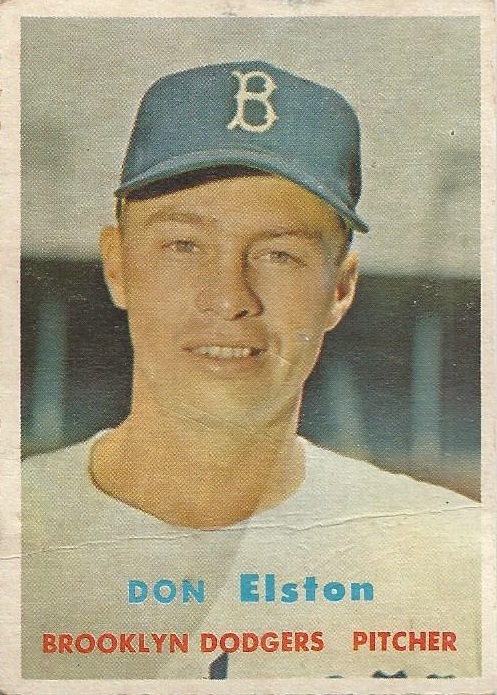 I paid 87 cents for this 1957 Topps Don Elston. Did not notice the crease until I got it in hand. 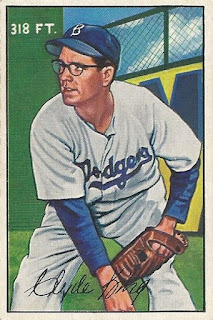 Doesn't bother me in the least, the card has good centering, presents well, and it's a Brooklyn Dodger from the '50s. I can't ask for more than that for less than a dollar. You've likely seen me post a Star Wars Tek card before, I'm just a sucker for acetate cards and always loved the films. 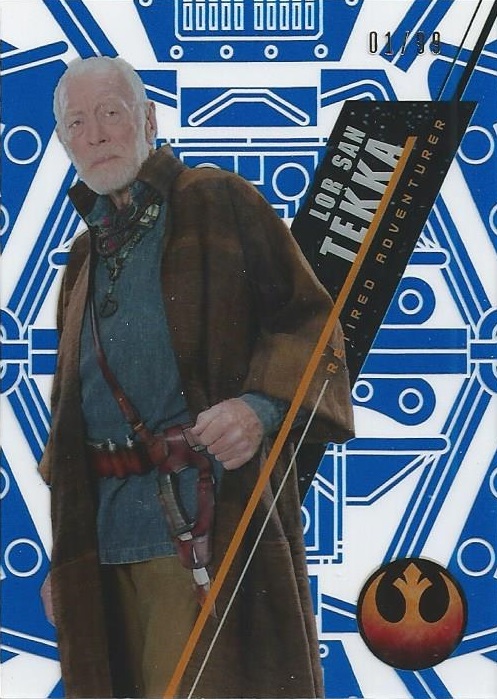 I'm not a total nerd about it like a lot of folks are, so the only thing I remember this character from is the opening scenes of The Force Awakens. I try to grab these Blue Rainbow parallels, #'d /99, any time I see them for less than a buck, and this one fit the bill at 97 cents. 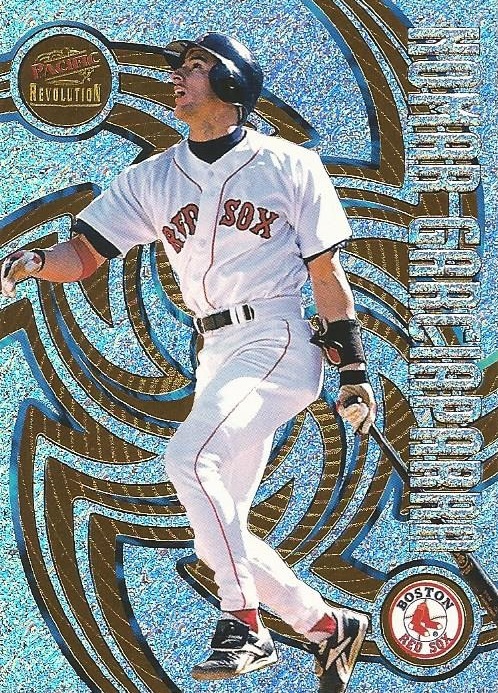 I like what Topps has done with some of the image variations in their flagship set over the last decade or so. I know they're not for everyone, but at least they do it in a way where you can easily ignore them if you choose and they won't interfere with your set collecting. 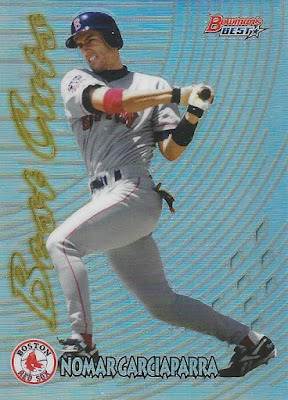 For team and player collectors I think it's a fun element to chase. 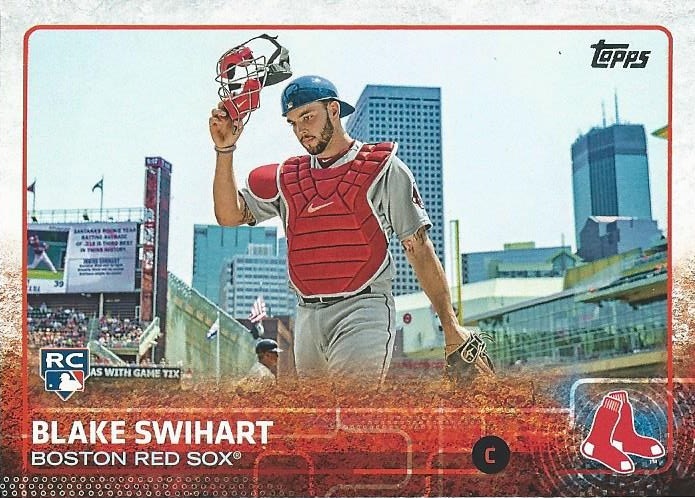 This Blake Swihart RC is a prime example, I like the image used here much more than the one on the standard version. 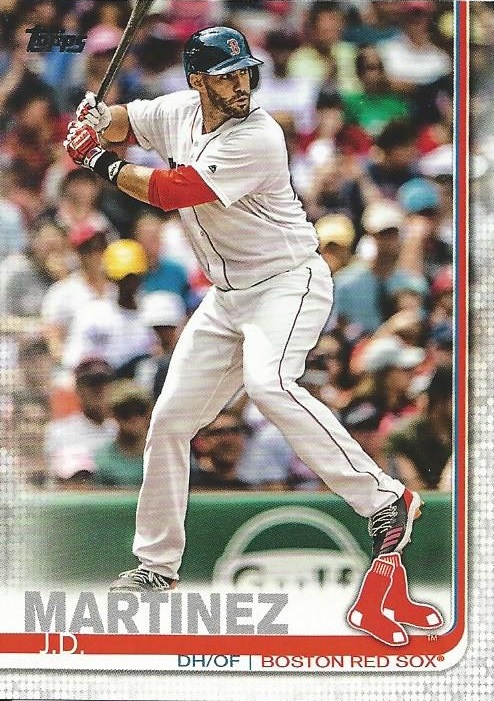 At $2.25, this is the second most expensive card in today's post. 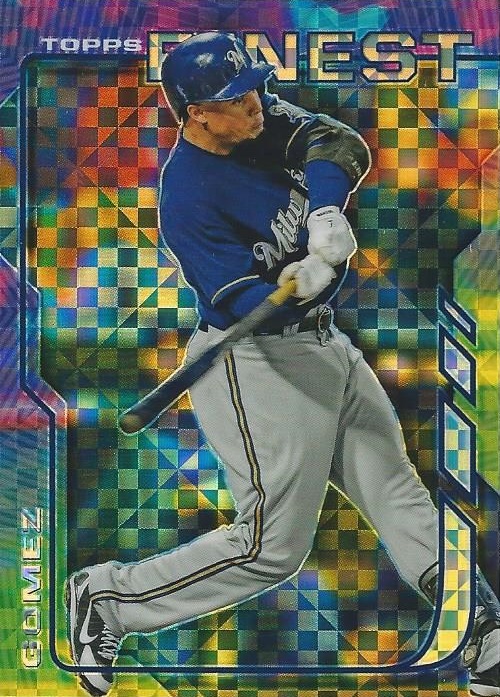 Can't get enough of these Bubbles Refractors from 2014 Bowman Chrome. There are just 99 copies of each in circulation, so they're rare enough to feel somewhat significant, but still available enough not to break the bank. 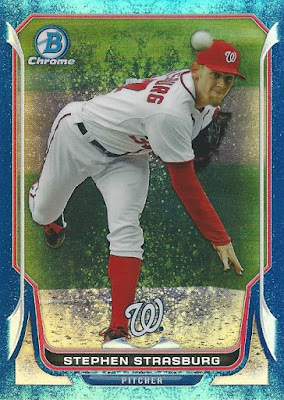 For example, this Strasburg cost me all of $1.15. 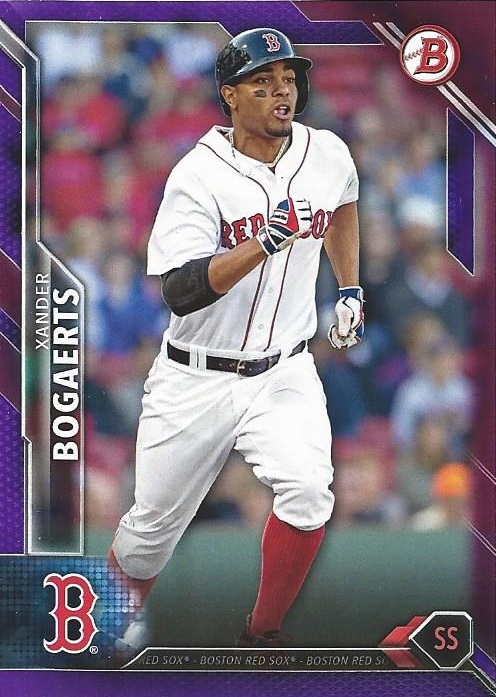 One more Xander Bogaerts card for today. 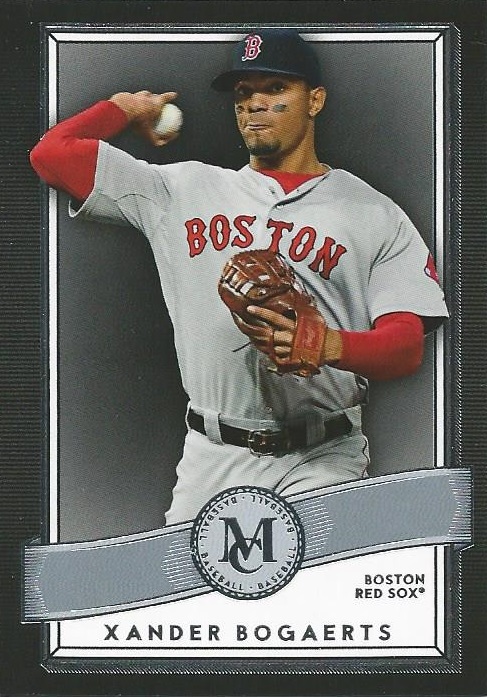 I believe Topps Museum Collection is maybe considered a mid-tier type product? Whatever the case, I'm certainly never going to buy any, but I'll definitely pluck Bogaerts cards from releases like that for my collection. Especially when they cost just 75 cents. This is my 130th Xander Bogaerts card and counting, though I know I have quite a few more that I just need to inventory and add to my collection proper. 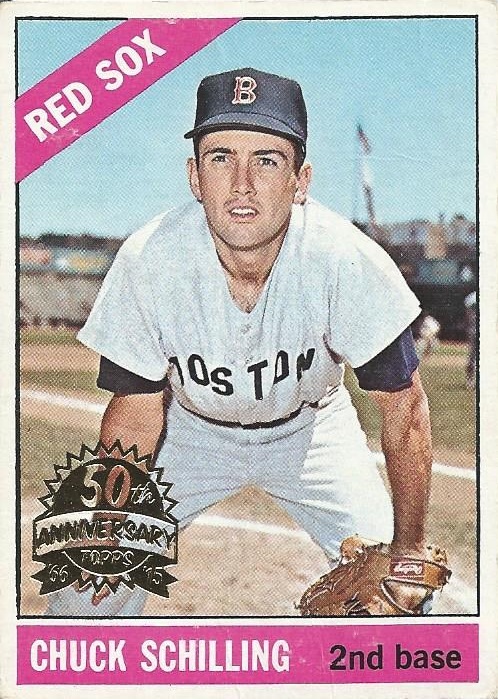 A week or two ago I posted a trio of '55 Topps Red Sox that I'd picked up while trying to plug some holes in earlier team sets. Continuing with that same theme, here's a '60 Jim Marshall that I grabbed for just 50 cents. It's slightly diamond-cut, but for two quarters this will more than do for my collection. 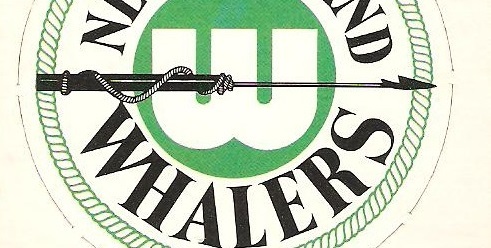 I already had a copy of this fantastic Rick Ley New England Whalers card in my collection, but this is a significant condition upgrade. Used $1.40 in credit for this one, but it's in amazing condition and Ley's a significant guy in the history of my favorite franchise. 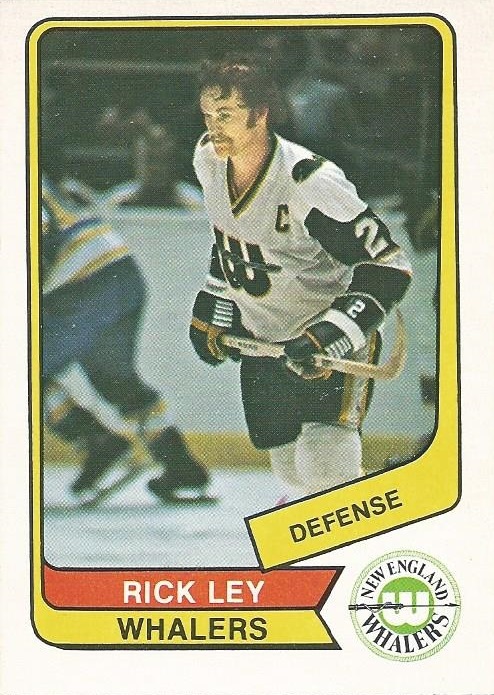 I really need to make an attempt to finish all of the '70s O-Pee-Chee WHA sets once and for all. Yup, one more Star Wars Tek card today. This is an even rarer Gold Rainbow parallel (#'d /50). I know many Star Wars fans hated the Ewoks, but I was just a little kid the first time I saw Return of the Jedi so they've never bothered me. 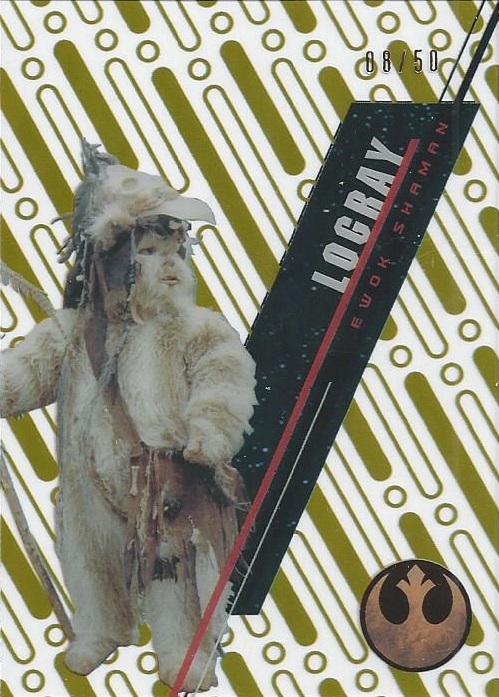 Anyway, I remember the character Logray most from the 'Ewoks: Caravan of Courage' TV movie that came out a year or two later. Watched that one and its counterpart, 'Ewoks: The Battle for Endor', many times growing up. 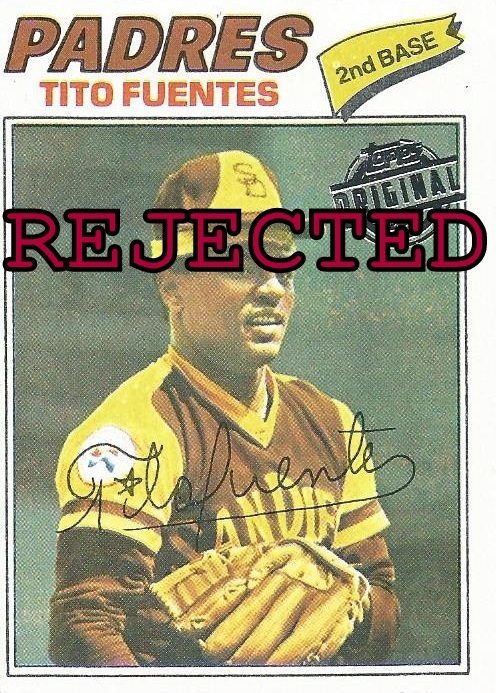 Believe it or not, this was the most expensive card in today's post at $2.50. 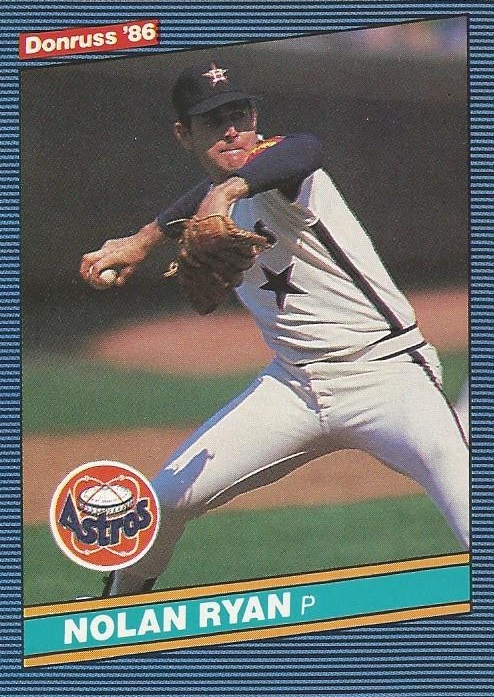 Loved Nolan Ryan as a kid, still enjoy picking up his cardboard to this day. I've been trying to back fill some of his '80s releases that I had as a kid, but that didn't survive into my adult collection. This one fit that bill nicely, especially at just 35 cents. I've got just about 10,000 baseball cards added to my collection on The Trading Card Database so far, and Nolan is one of just three players who I have 100 cards of or more (Bogaerts and David Ortiz being the others). 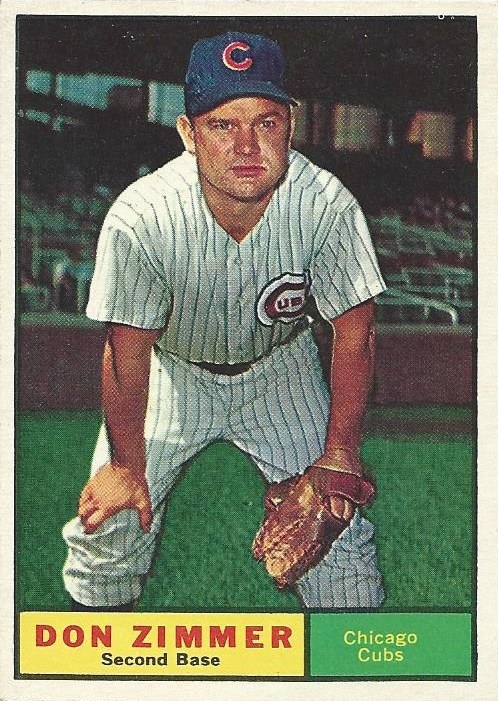 Last card for today, as the $1.25 I spent on this Don Zimmer brings me to $19.48 for a running total. I'm sure I could scrounge around for another 50 cent pick-up, but we'll just call it here. 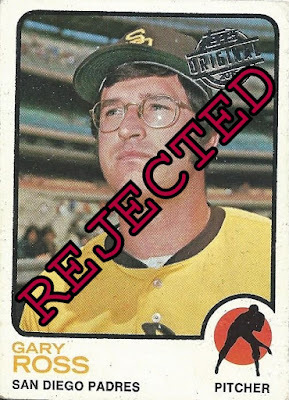 I always liked Zimmer because he seemed to me like the consummate baseball lifer. 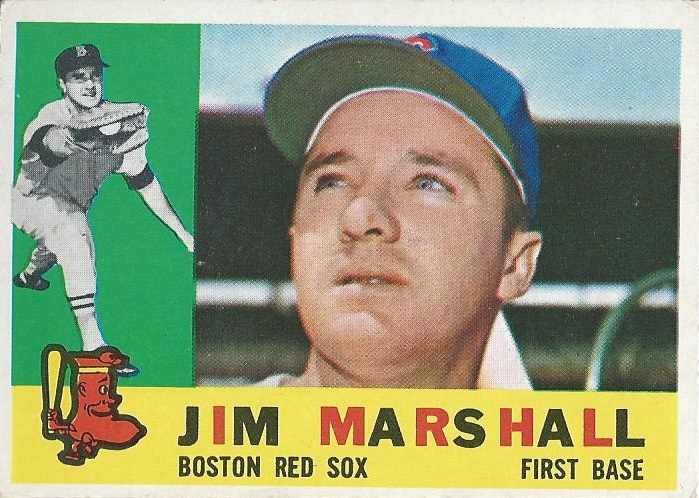 His 1961 Topps card is pretty great, I was happy to snag this copy in great condition as cheaply as I did. 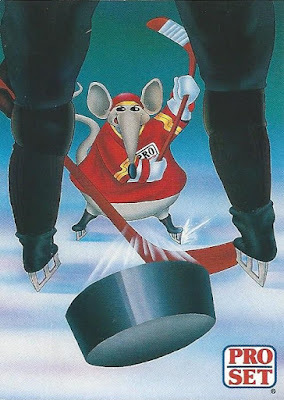 That's it for today, I'm off to watch the Bruins hopefully even the series with Toronto here! I really don't buy much new product these days, haven't for a few years now. 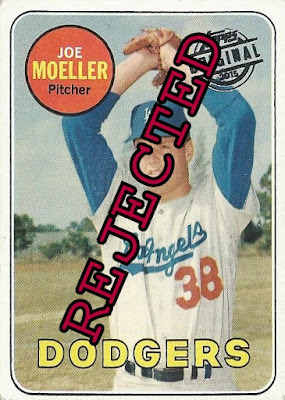 so believe it or not this PWE contained the very first 2019 cards I'd seen from any manufacturer or set to date! They came in the form of five Red Sox singles from the 2019 Topps flagship set. I'd seen the fantastic image on this Eduardo Nunez World Series Highlights card around the blogs, very pleased to have my own copy. 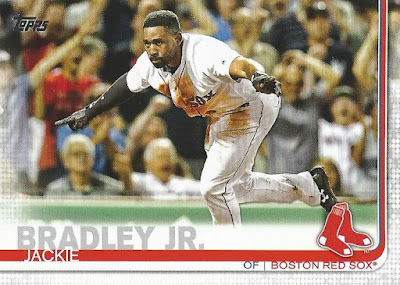 Another interesting shot on JBJ's card. 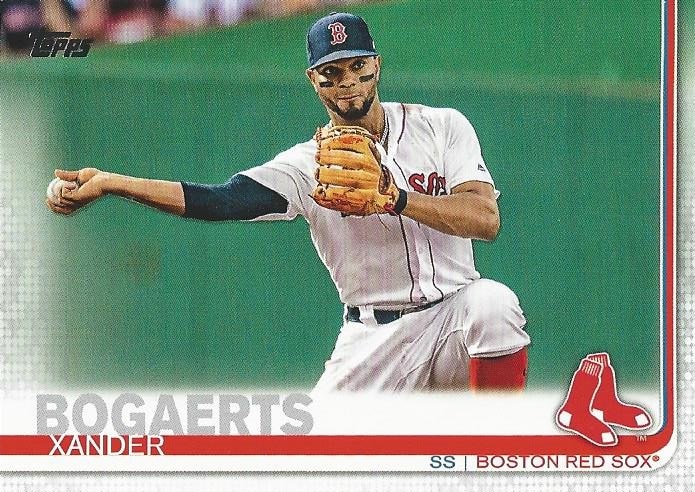 Any trade package that includes a new-to-me Xander Bogaerts is an absolute winner. 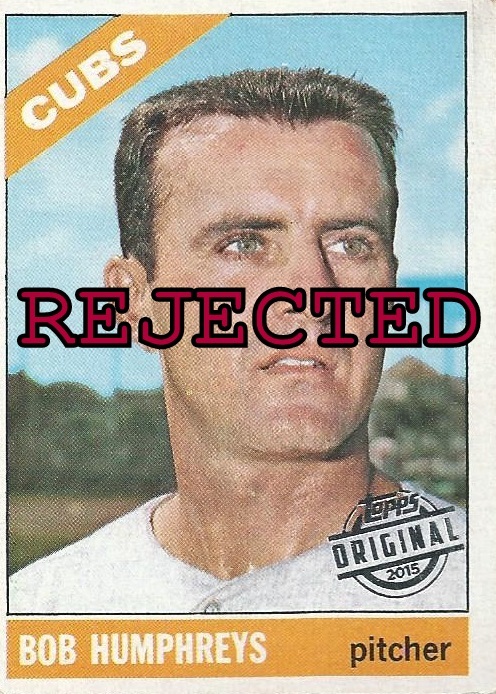 I do wish Topps hadn't decided to crop this photo so tightly though. I can't help but feel like this would've been a nicer card had we actually been able to see the infield dirt along the bottom. At this point I have precious few cards of J.D. 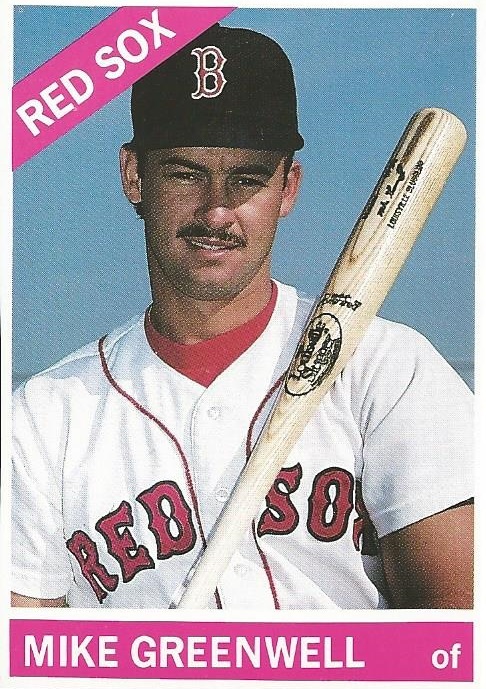 Martinez with Boston, pleased to land one here. 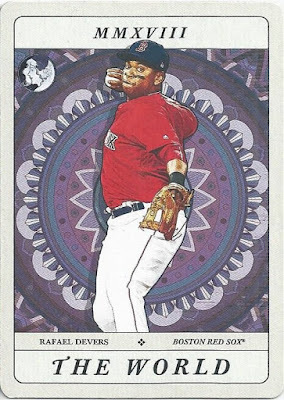 Finally, Rafael Devers' flagship card. 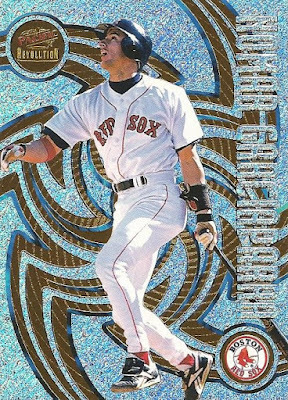 A shiny card from one of my absolute favorite parallel sets of the decade that was the '90s, 1994 Pinnacle Museum Collection! Some day I will own this entire set in parallel form, mark my words. Here's one that's from a brand new set for me, 1978 Grand Slam. I confess that I really don't know much about this release at all. 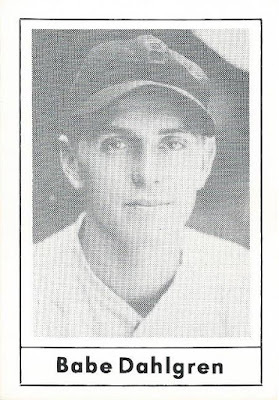 I'm most excited to get my very first card of Babe Dahlgren, who doesn't have a whole lot of cardboard out there. Just 32 cards of the All-Star and World Series winner in The Trading Card Database. Another oddball here, which is no surprise given who these came from. 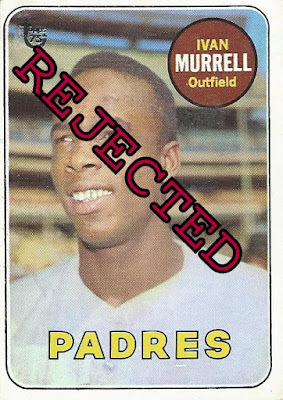 Obviously "inspired" by the 1966 Topps release, these were included in issues of Baseball Card Magazine in 1991. A couple of awesome and really random additions to my team collection with this last pair! 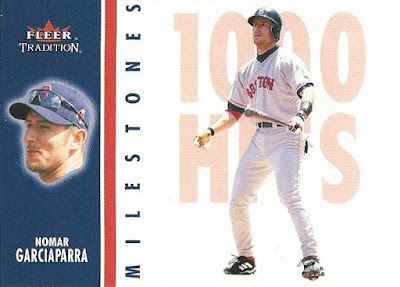 Of course, there were some other cards from licensed, major manufacturers as well, like this Fleer Tradition Milestones insert of Nomah. 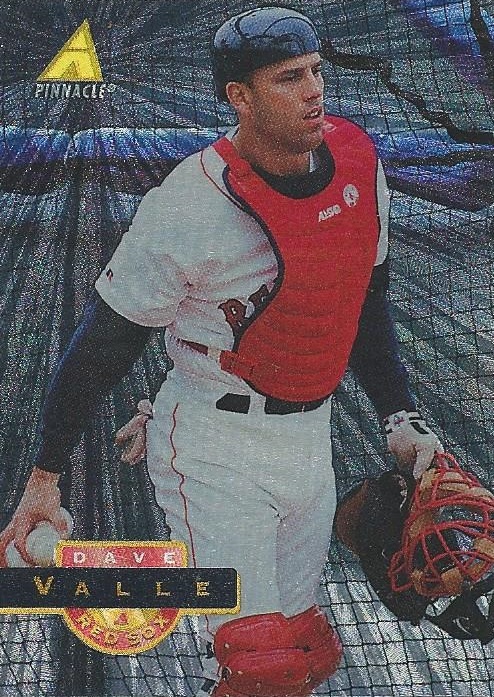 Or this extremely shiny, thus extremely pleasing, Jason Varitek courtesy of mid-2000s Donruss Zenith. I believe this is known as a Museum Collection parallel, at least I hope I cataloged it accurately as such. I really liked these Tarot inserts from 2018 Gypsy Queen when I saw them on a few blogs last year. 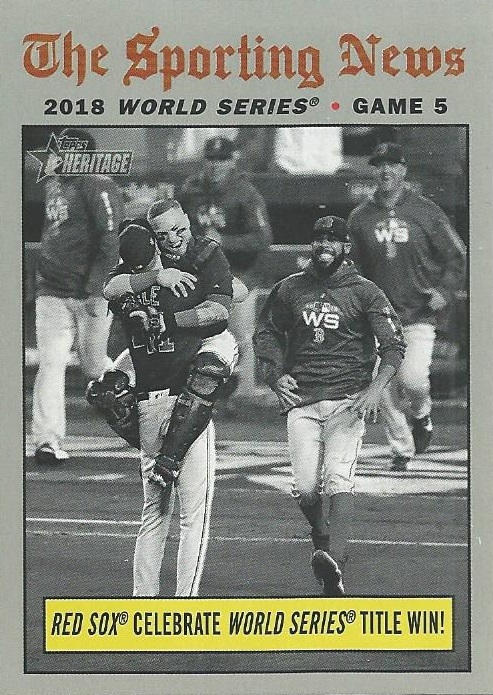 So much so that the Chris Sale card from this insert set is actually the only 2018 Gypsy Queen card of any sort in my collection so far. 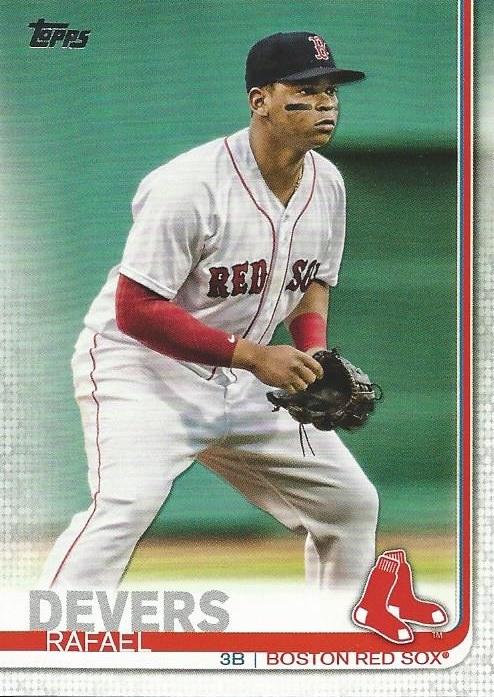 Nice to have Rafael Devers' card to accompany that one. Nick hit a home run with this one. 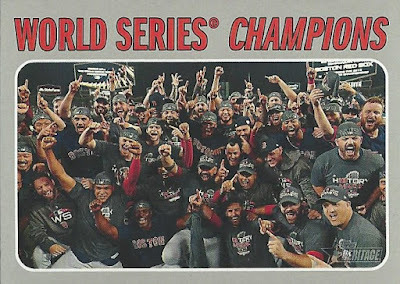 Here's another Fleer Tradition insert. 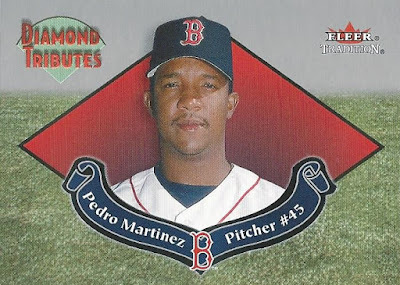 The last one featured one of the best hitters on the team during my teenage years/early 20s, this one features one of the better pitchers from that same time span. 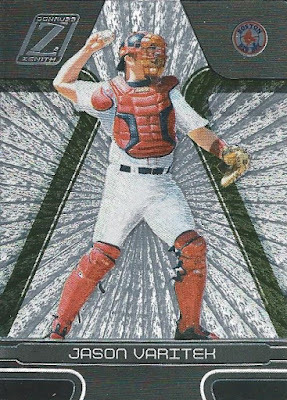 I'm not sure how I feel about this design, but I have to give Fleer credit for including a lot of green grass on a baseball card I guess. 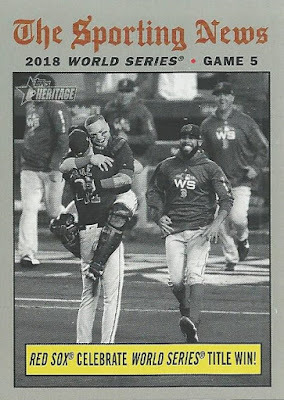 If you sat down and asked me to design the "loudest" baseball card I possibly could, I'm not sure I could do better than Pacific Revolution. 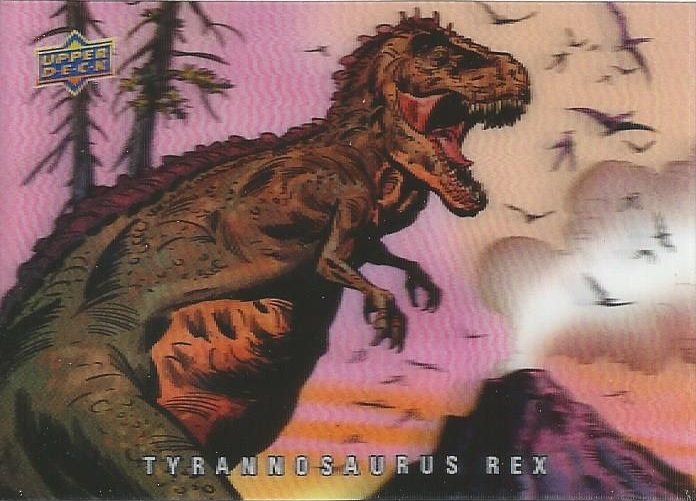 I can totally see why someone wouldn't like this set, but having collected as a kid during the early to mid-'90s busy cards like this are just fine with me. The other shiny Garciaparra that came in this batch is one I wasn't familiar with at all. 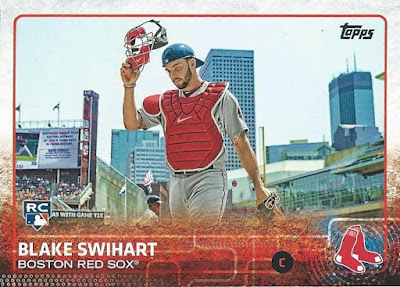 This is a throwback insert that was actually in the 2017 Bowman's Best release. 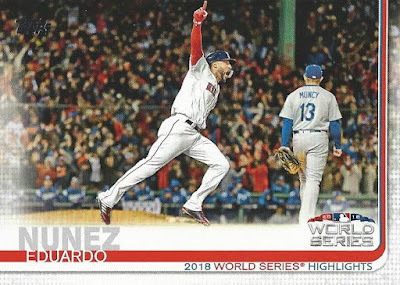 Easily one of my top 3-4 favorite cards in this package. I like the clean design. Nick managed to include a couple of vintage cards as well. 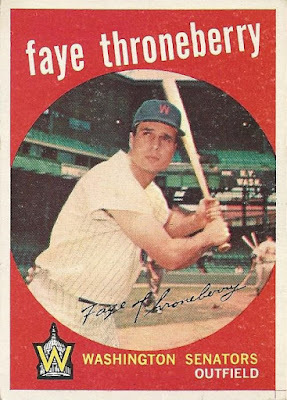 There was a note on this one reminding me to check the back, as soon as I saw that I knew this was a brand new 1970 O-Pee-Chee for me. 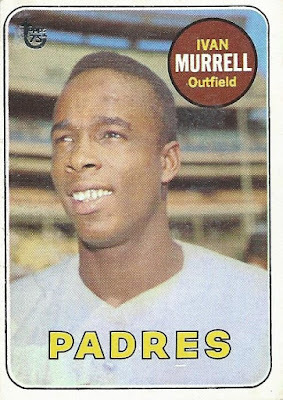 Love this shot of a smiling George Scott, and the timing is perfect as well given that Topps is doing their 1970 release for Heritage this year. Another card down in my painfully slow pursuit of a 1959 Topps set as well! A significant one at that, especially for a Red Sox fan. This is my 298th card from this release now. I'm past the 50% mark for the set, and will hit the 300-card milestone very soon, which feels significant. Finally, one last card, a buyback! 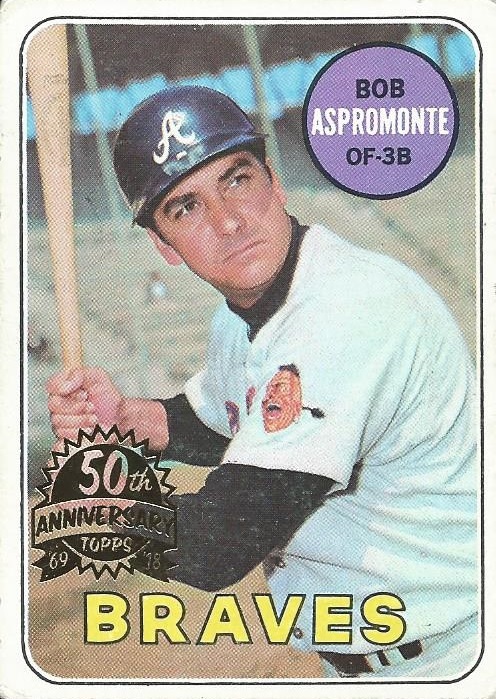 Bob Aspromonte's 1969 card. 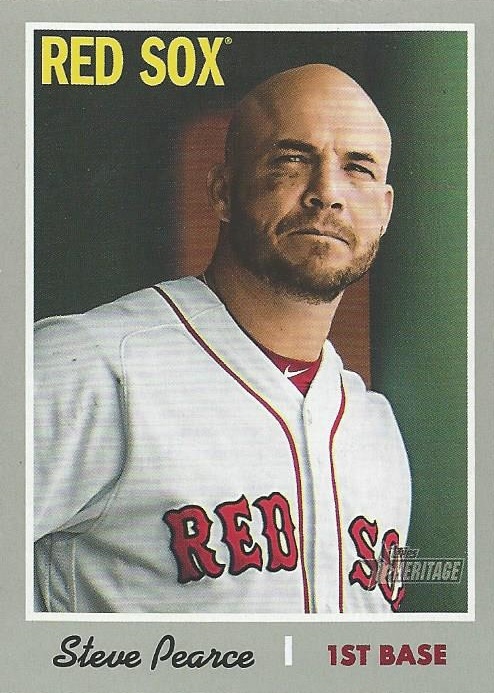 This one came as a box-topper in 2018 Heritage, though I'm sure Nick probably plucked it out of one of those insane discount boxes he always seems to find. Wherever it was sourced from, I sure am glad he decided to send it to me. 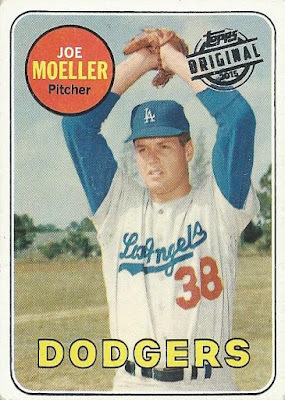 While maybe not politically correct in this day and age, that's certainly a unique shoulder patch that Bob is sporting. 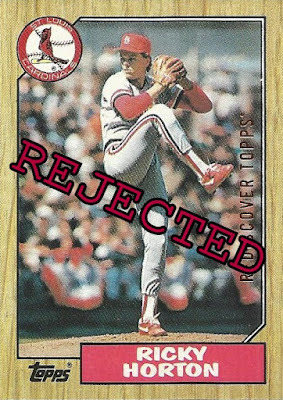 Will this buyback make the franken-set? Well, there is already a card in slot 542; Ricky Horton on the '87 Topps design. 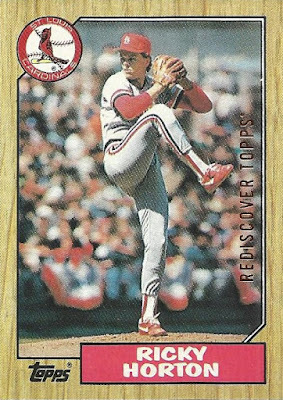 I like the contrast between the wood-grain border and all that red between the Cardinals logo and nameplate in the design and then Ricky's uniform, the bunting, and splotches in the crowd. I don't think it does enough for me though to beat out a sweet Heritage box-topper like the one Nick sent. Into the binder with the new card, out with Ricky Horton! For now, I'm off to see if the Bruins can somehow rally in the third here. Ugh. March was a little crazy for me. So much so that I didn't get around to even a single Buyback Franken-set post for the entire month. Let's prevent that from happening in April too by getting to a great package of buybacks that was generously sent my way a few weeks back now by Brett (better known as 'bamlinden') of My Hockey Card Obsession. 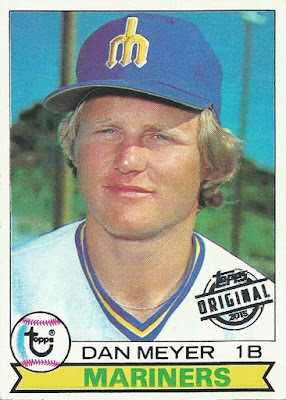 Brett sent me a baker's dozen of buybacks; one of them was a duplicate and today we'll review the other twelve to see how they fare as far as the franken-set. 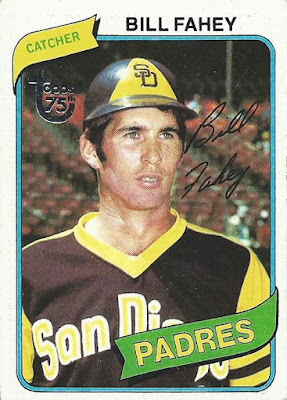 First up, catcher Bill Fahey's 1980 Topps card. 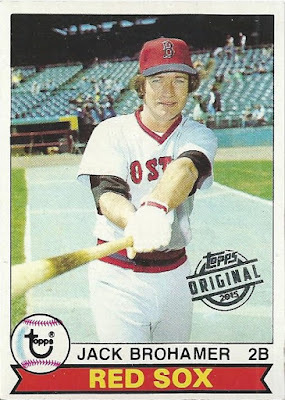 This one is from the 2014 Topps 75th Anniversary buyback program, and if I'm not mistaken 1980 was the most recent set you could possibly land a buyback from at the time. A pensive Pena, also from the 2014 program, already occupies slot 44 of the binder. Something about Roberto's "The Thinking Man" pose combined with the sparse background has always made me appreciate this one. 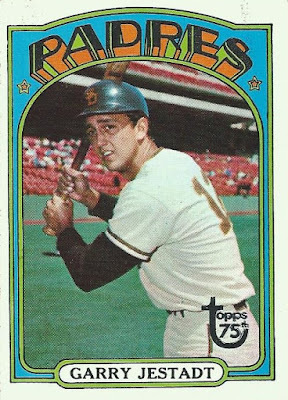 How about another Padre (you'll notice a theme here as the post develops), this time courtesy of the great '72 Topps release. 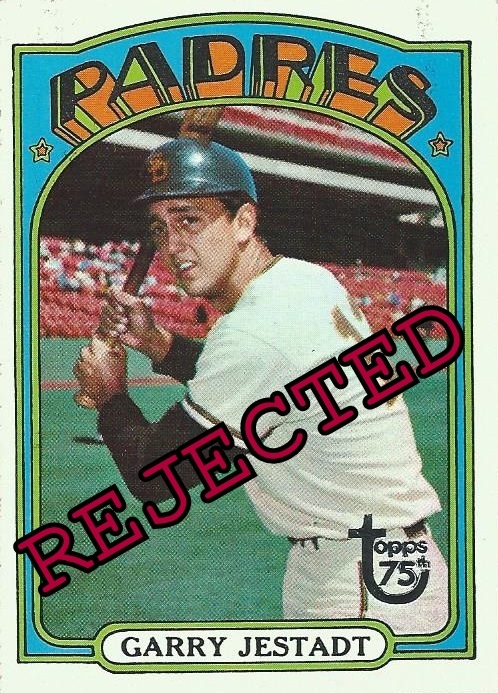 If I were to rank Topps' efforts from the '70s this one would be fairly high on the list, so I always appreciate getting them in buyback format. If you don't recognize Garry Jestadt by name, don't be too hard on yourself. He played just three seasons in Major League Baseball, and never eclipsed 100 games played in any of them. 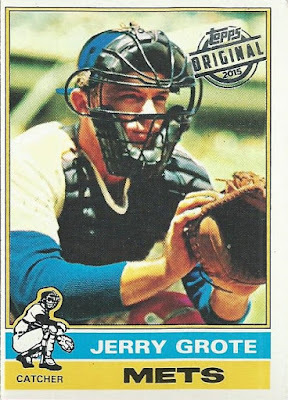 This '76 Jerry Grote has been holding down slot 143 in the binder since the early days of this project. Even being a '72 wasn't enough for Garry to supplant that fantastic photo of Grote. 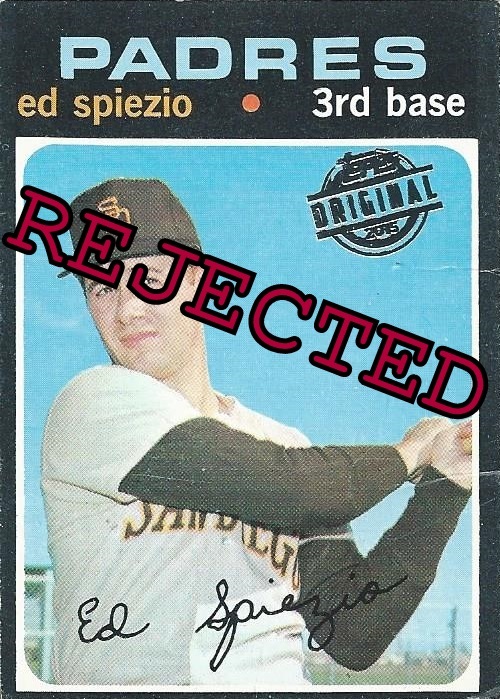 Moving back another year in time, how about a '71 Ed Spezio? 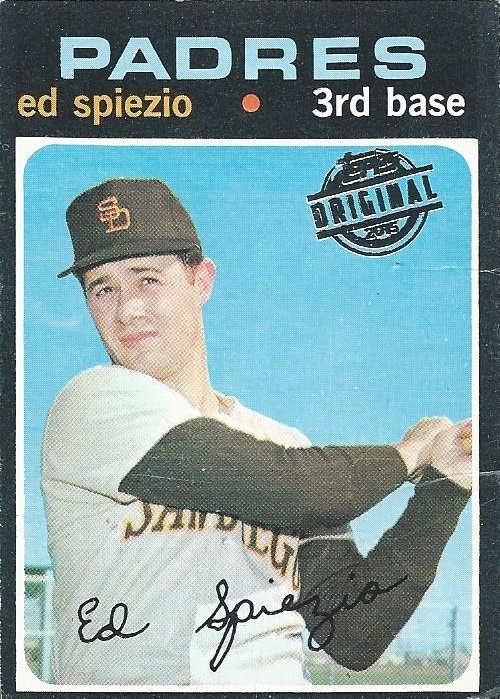 Ed hit just .231 in 1971, his last full season with San Diego. Seems like Brett somehow stumbled upon a treasure trove of Padres buybacks! Rough match-up for Spezio, as he's pitted against a Heritage Chuck Schilling buyback here. 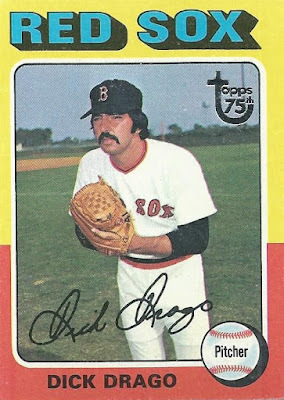 My Red Sox fandom wins out. 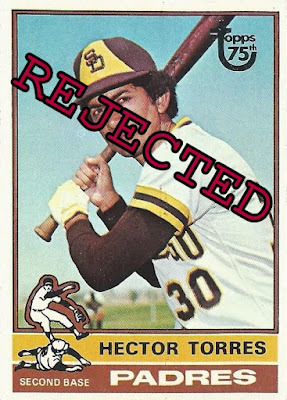 The stream of Padres buybacks continues, with a '76 Hector Torres. Hector batted on the wrong side of the Mendoza Line in 1976, and was out of baseball a year later. A nice enough posed photograph though. Torres draws an '89 Brett Butler in the battle for franken-set induction. This one's sort of a coin flip as I don't have a real affinity towards either card. Butler was the better player by far, though. So, I'll stick with him. 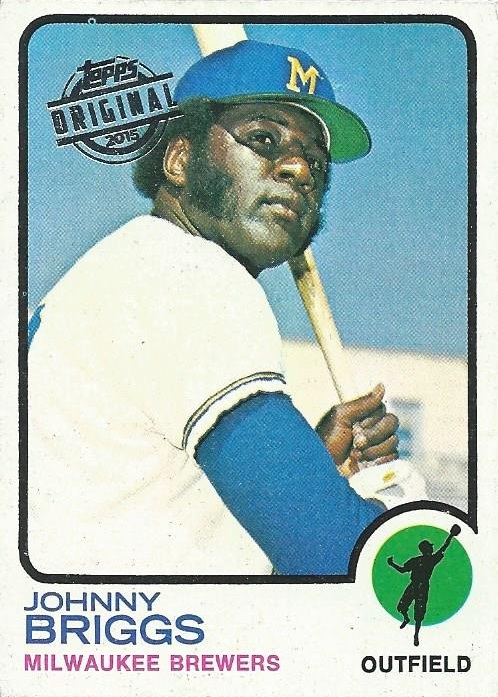 How about the sideburns on this '73 Johnny Briggs? Now that's a '70s card! The power-hitting Briggs was in the midst of a five-year stretch where he hit double digits in home runs each season. 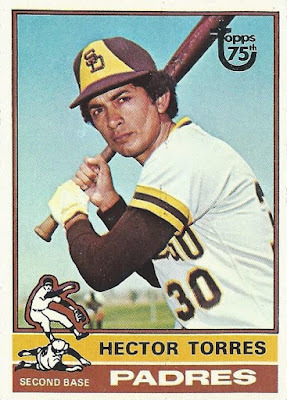 He was even named on an MVP ballot or two in '73. 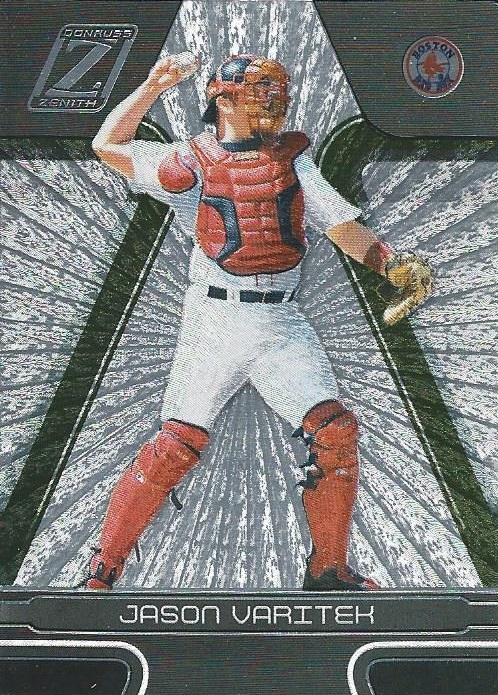 To me though, the best thing about this buyback is that it's a new number for the franken-set! 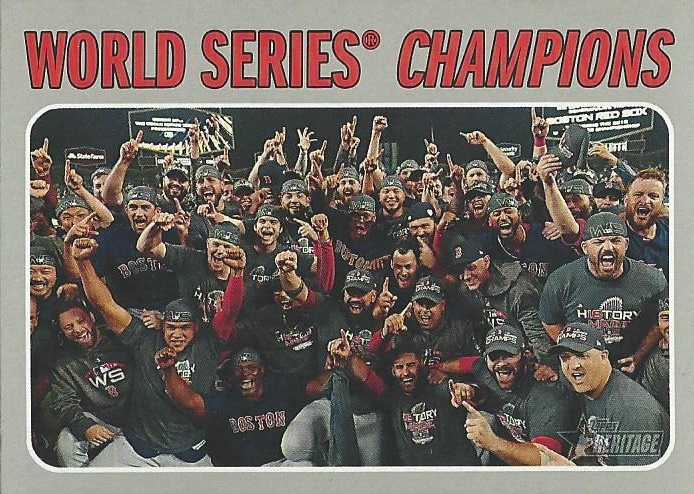 Even better, it gets me a new completed page in the binder! 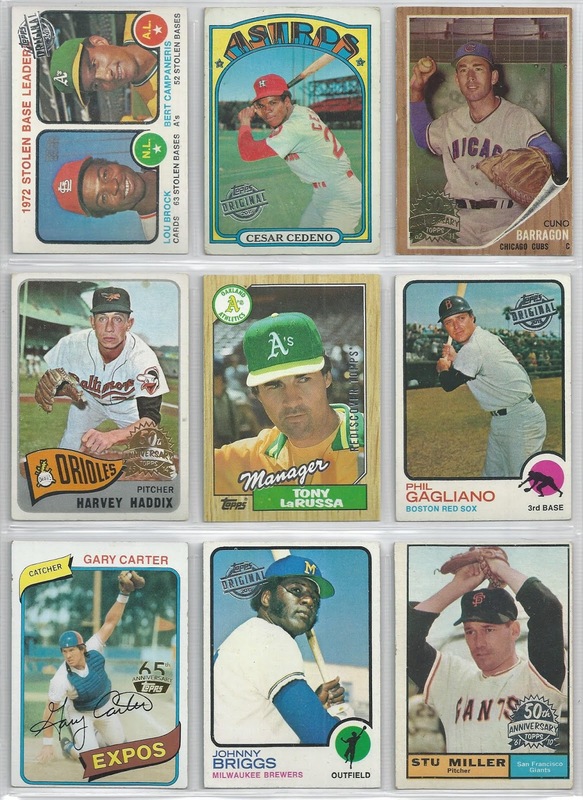 Plenty of strong candidates here for best buyback on the page, but I guess I'd have to go with that great Expos Gary Carter at lower left. 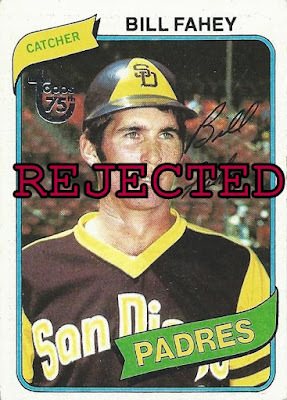 And we're back to the Padres! Dave Roberts was with the club for a few years, but was constantly bouncing back and forth between the minors and the big league club. I love the shoddy chest protector depicted on this card. 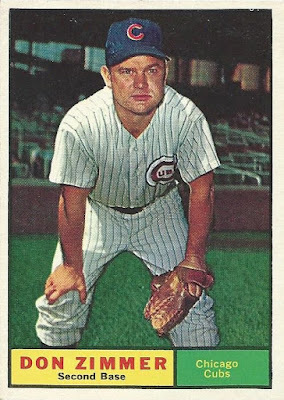 Previously holding down slot 342 was pitcher Bob Humphreys, who appears to be the owner of one of the flattest heads in human history. 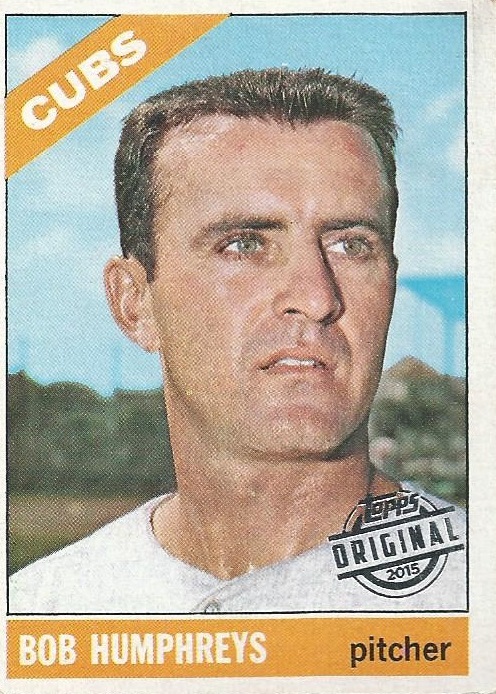 I like Roberts donning the tools of ignorance over this cap-less '66 Topps offering. 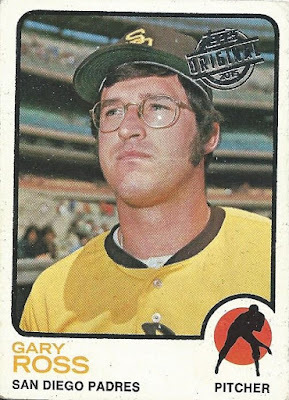 Next up, a bespectacled Gary Ross courtesy of '73 Topps. 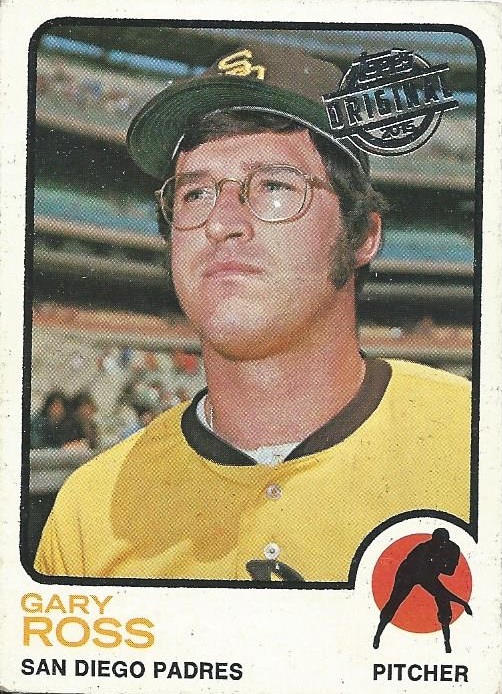 I had to do a double take when I saw Gary's stats from 1973. 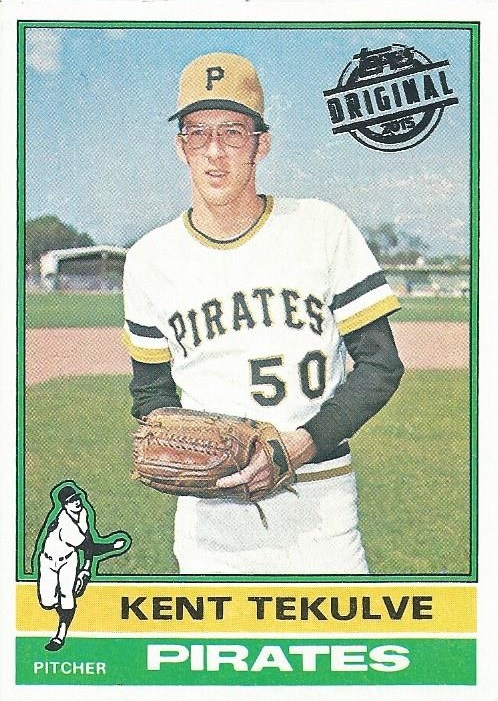 He made 58 appearances, but to the tune of a 5.42 ERA. 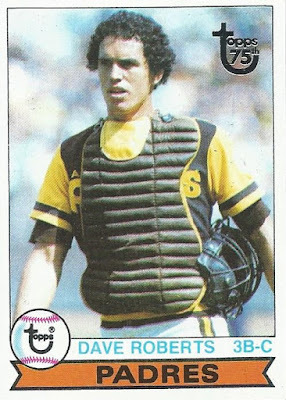 The Padres must have had a rough set of arms in the bullpen to say the least if they rolled Ross out there close to 60 times despite that downright terrible ERA. Ross didn't stand a chance as far as the franken-set goes, as he was pitted against a rookie card buyback of the great Kent Tekulve. It was obvious how that one was going to go. I've always found this '77 Topps Tito Fuentes card to be somewhat comical, and I'm happy to finally have a copy in buyback form. 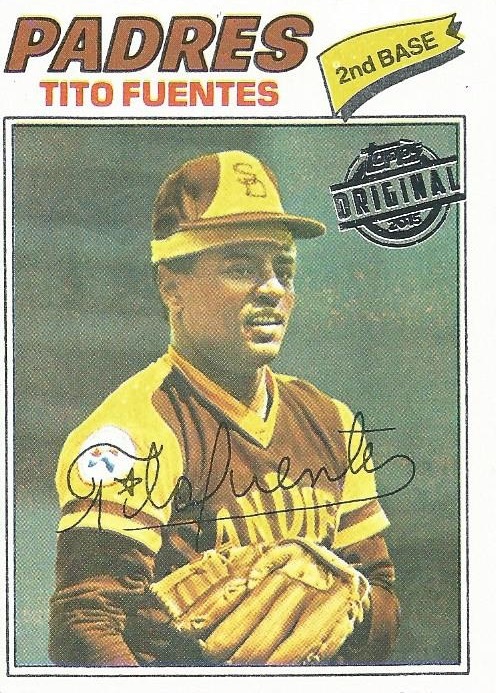 I've mentioned this on the blog before, but something about that headband/hat combo makes Fuentes look a bit like Sloth from The Goonies to me. 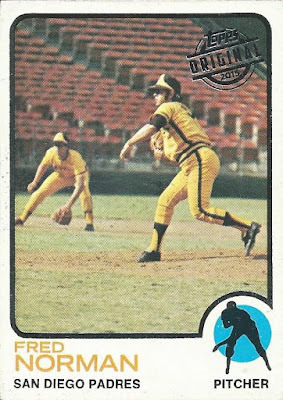 This '79 Jack Brohamer stands between Fuentes and the franken-set. The fact that I'm a Boston fan came into play here as well. 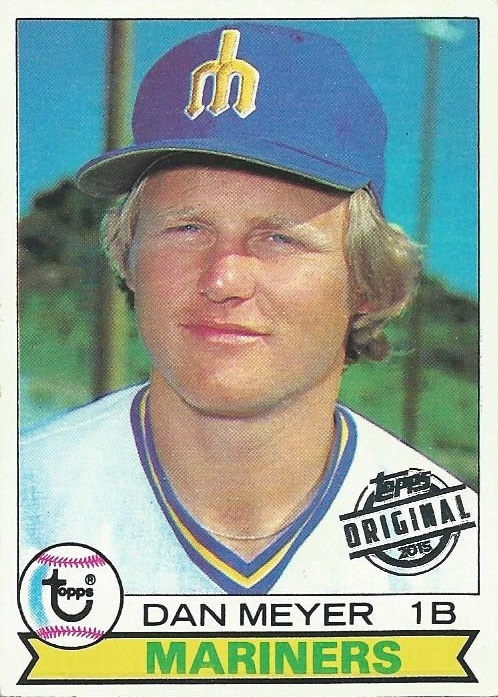 Speaking of '79s, here's Dan Meyer rocking that awesome early-era Mariners trident cap. 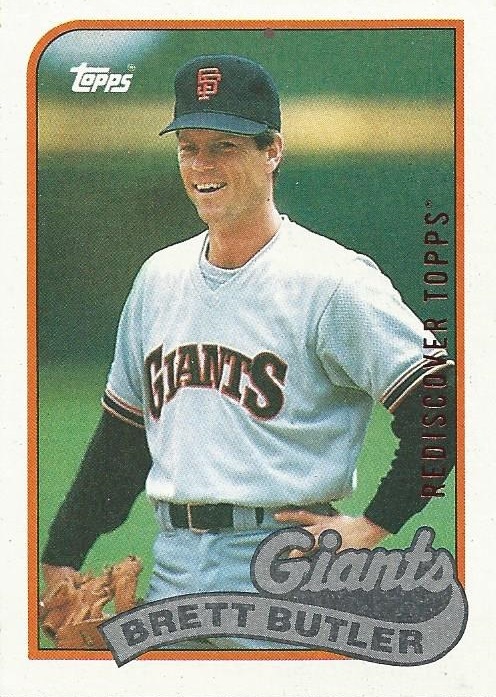 I didn't realize that Meyer played for a dozen years in Major League Baseball, but to be fair he hung up his cleats when I was still just a toddler. This is my first #683 buyback as well. Interesting that with all the Padres in this package, the two cards that were new numbers for the franken-set were a Brewer and a Mariner. 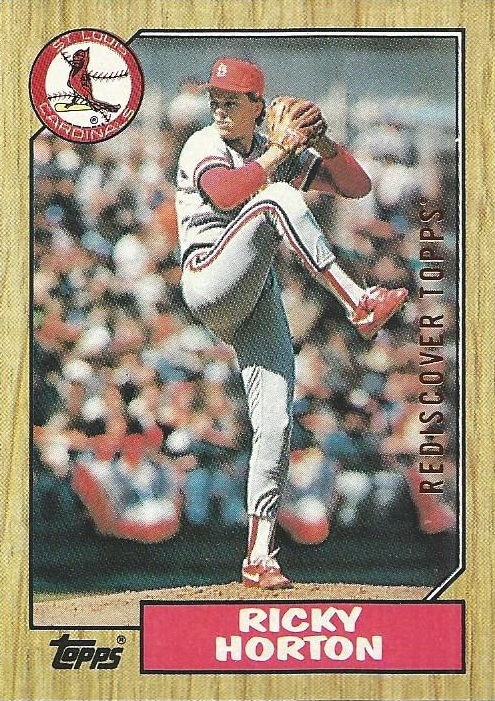 Here's a buyback that I'm both familiar with, and unfamiliar with at the same time. 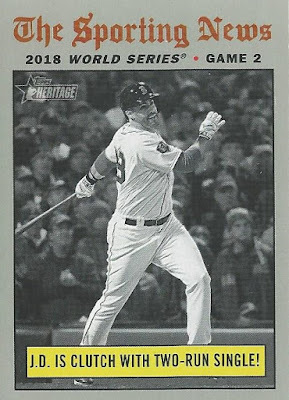 This one is from the 2014 Topps buyback program, but I have this exact same card from the 2015 and 2018 Heritage buyback programs as well. ...and obviously the result is the same here. 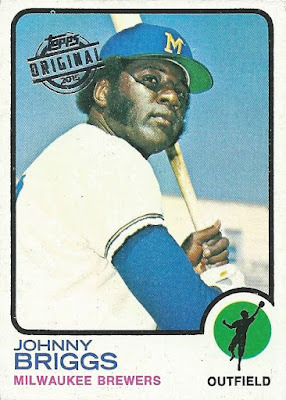 Johnny Grubb was coming off of a great rookie season in 1973 when this card was printed up, in fact he finished 6th in Rookie of the Year voting. 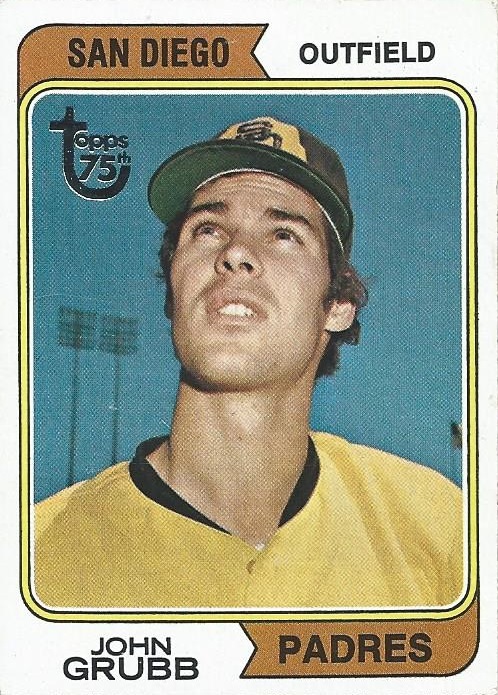 1974 was another good year, in fact Grubb was named an All-Star in '74 for the lone time in his lengthy MLB career. 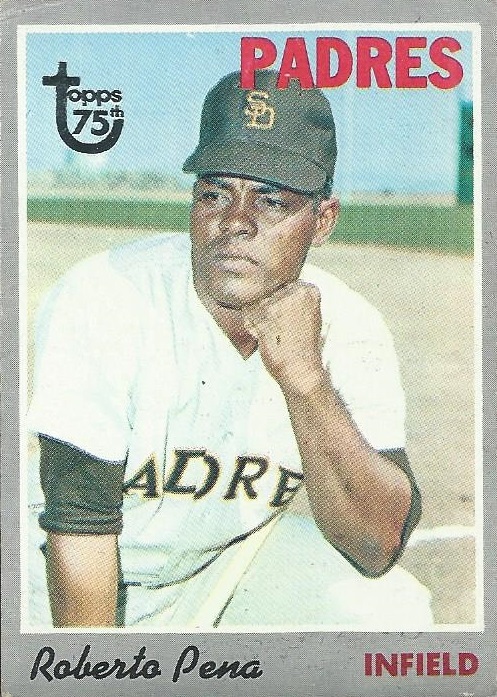 Grubb actually has to square off against a fellow Padre for the franken-set. 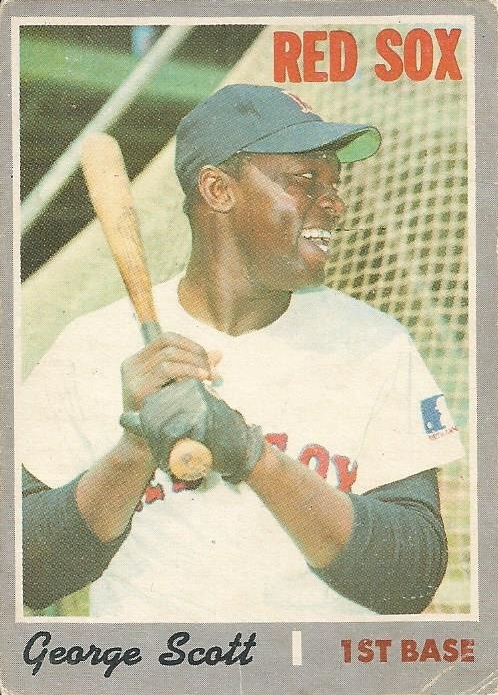 This '73 Fred Norman is such an under-rated card in my humble opinion. 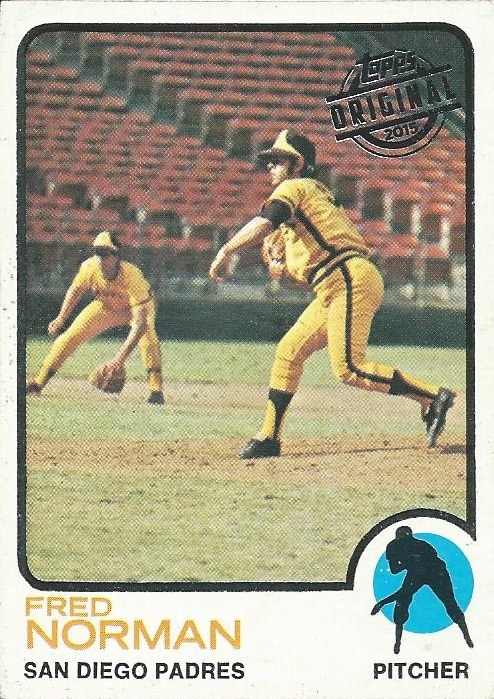 The great action shot, the empty stands, those glorious mustard-color uniforms. It's going to take a very special buyback to unseat this one. John Grubb is not that buyback. We'll wrap it up with one last non-Padres buyback. 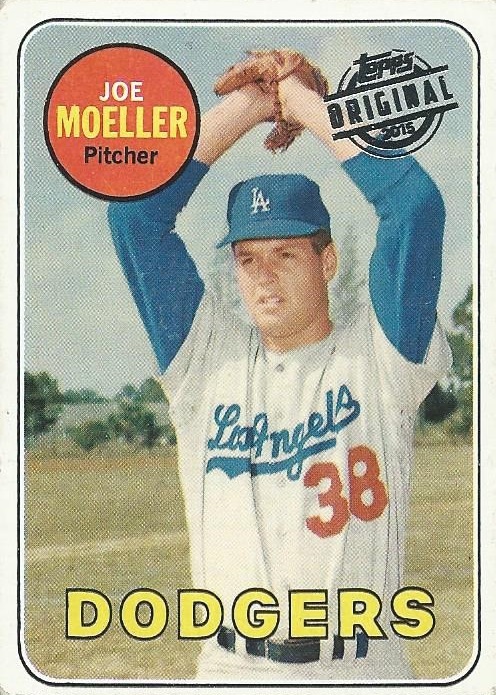 Love this '69 Joe Moeller, featuring a classic wind-up pose. 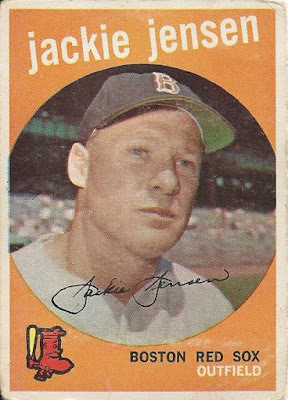 I'm not all that familiar with Joe's career, but any buyback from the '60s is cool in my book. Who does Joe draw in the battle for franken-set inclusion? Ouch! Rough opponent for Moeller. Cal Ripken Sr. with a tip of the cap on his '88 Topps release. This one came to me courtesy of Dime Box Nick if I recall. 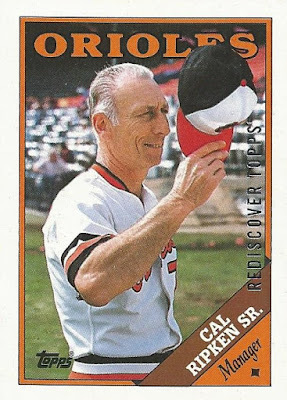 As much as I'd have loved to have included Moeller in the binder, I just couldn't oust the Ripken. Thank you so much Brett for your thoughtfulness and kindness in sending these my way! 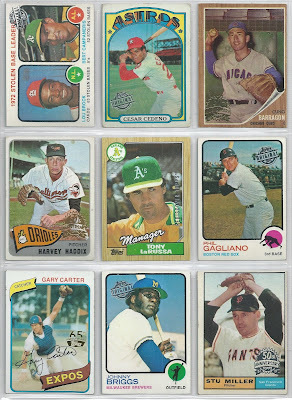 All twelve of these now have a home in my collection, and the one that was a dupe has already been set aside for another blogger that I know will appreciate it. Down to 146 empty slots in the binder still to fill!